As with any career change, it pays to do your research before you take the leap. If you’re have experience as an in-house personal assistant, you have a head start, but you’ll still need to do your reading so that you can learn about your competitors and how to best present yourself. Do you have a special skill set? Are you multilingual or an SEO expert? What kind of work would you like to do? How many hours do you want to work? One of the biggest advantages of working as a virtual assistant is that you get to choose who you work with. Whilst you might not be able to be that picky at first, think about which industries you find interesting or how you’d like to develop your skills so that you can push yourself in the right direction. 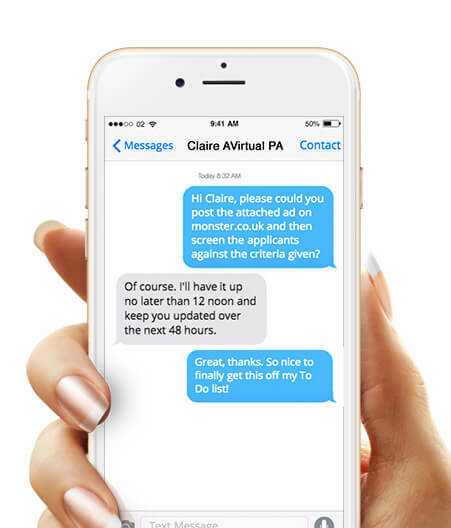 If you’re leaving a job as a personal assistant to go virtual, you could ask your colleagues or employers to recommend your services to their clients and friends. Make a LinkedIn profile and start messaging potential clients. Create a website describing your services and think about offering a free trial to new customers so that they can experience the benefits of your assistance first hand. Sites like UpWork provide a great platform for freelancers and whilst the site takes a cut of your earnings, it’s a useful way of initially building a client base. Otherwise, you could consider applying to a virtual services company, such as AVirtual. We train all of our virtual assistants, pair them with clients based on their profiles and supply them with technical support. There’s less freedom as we require our virtual assistants to work from our offices, but it’s a good way of establishing yourself as a trusted VA and means that you are guaranteed a constant supply of work. However, you will also need to be prepared to be flexible. The best virtual assistants are the ones who can anticipate their client’s needs and adapt their skills to provide a high-level of dedicated assistance. If your client asks you to assist with an area that you’re not skilled in, be honest with them and offer to find a specialised freelancer who can help. When you do find a suitable freelancer, make sure to save their details so that you can contact them again in the future if need be. HOW WILL I COMMUNICATE WITH CLIENTS? The mode of communication will usually depend on your client’s preference, but it’s good to be able to offer suggestions especially if the client has never worked with a virtual employee before. At AVirtual, we encourage our virtual assistants and clients to meet at least once a week on FaceTime or Skype. It’s much easier to get to know someone if you can read their facial expressions and relate to them as a human being, rather than just a computer screen. Day to day correspondence might be over email, text or whatsapp. Ask each of your clients how they like to be contacted and try to create a system that you stick to so that you can both incorporate it into your daily routine. What about the technical side of things? Trello – (com) is an easy to use task management tool that allows you to create boards to organise anything you’re currently working on so that you can easily view your progress and invite others to contribute to the project. You can set up customised workflows, checklists, deadlines, discussion boards and easily attach files, images and videos. Todoist – (com) allows you assign tasks and subtasks to yourself using labels and filters for maximum organisation. It also integrates other software such as Google Drive and Cloud Magic, allowing you to easily link all of your content so you don’t have to keep opening different tabs on your desktop. PlannerPro – (apple.com) is so effective that it’s becoming part of our daily software in the AVirtual office. It’s designed to organise your day into one easy to read calendar and allows you to set deadlines on tasks. the basic app is free to download or you can opt for an ad-free pro version for a small yearly subscription. Wunderlist – (com) is like Todoist, but for the more creatively minded. It features a selection of background images so that you can customise the app to your personal preference, allows you create lists and deadlines, and save webpages and links for you to refer to at a later stage. When you want or need to take a break from working, you will need to give your clients advanced warning and offer a solution for cover. Here’s where it’s especially useful to have built up a network of connections in the virtual world as you may be able to reach out to another virtual assistant to see if they can take on the work whilst you’re away – we often help out VAs by providing cover assistance. Just be sure to fully brief your replacement on your client and their expectations before you get on the plane. Make yourself stand out from the competition by creating a unique brand. It could be the services you offer, the length of the trial period, or the way you present your research. Be as creative as possible. Whilst you might have your specialties and set ways of working, every client will expect something slightly different and the most successful virtual assistants, are those who can provide a truly personalised service. Clients are much more likely to continue using your services if you’re committed and enthusiastic about the work. Use your initiative to come up with ways to make their lives easier. It could be something as small as colour coding their daily schedule. Want to become a Virtual PA, apply to join the AVirtual Partnership Program! We decline 200 applications for each assistant we accept.